Now there is a clear pattern, light and dark arms spiraling out. Can we understand this pattern? 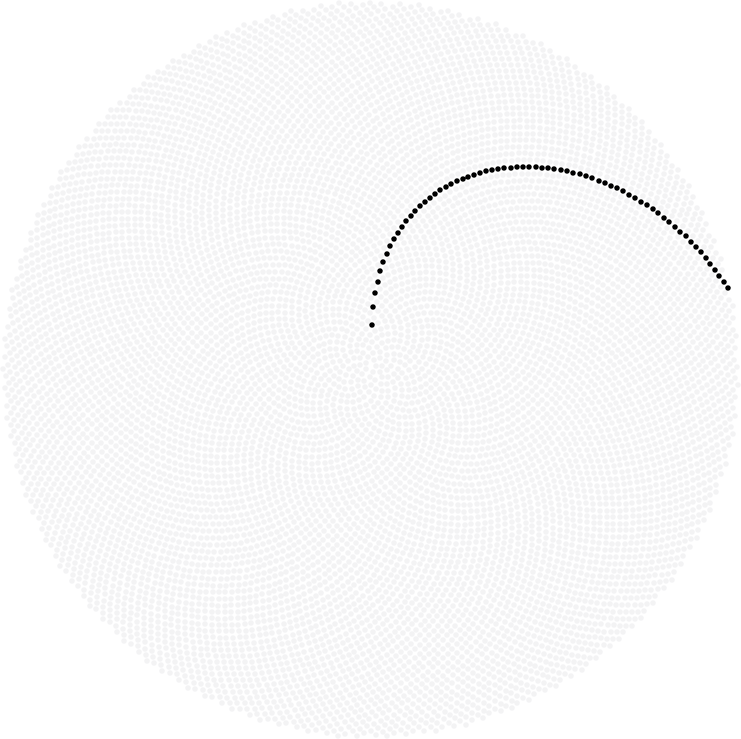 More importantly the curves next to these ones give numbers one more or less than a multiple of six.  Every prime number has this form (all other numbers are multiples of 2 or 3 or both). 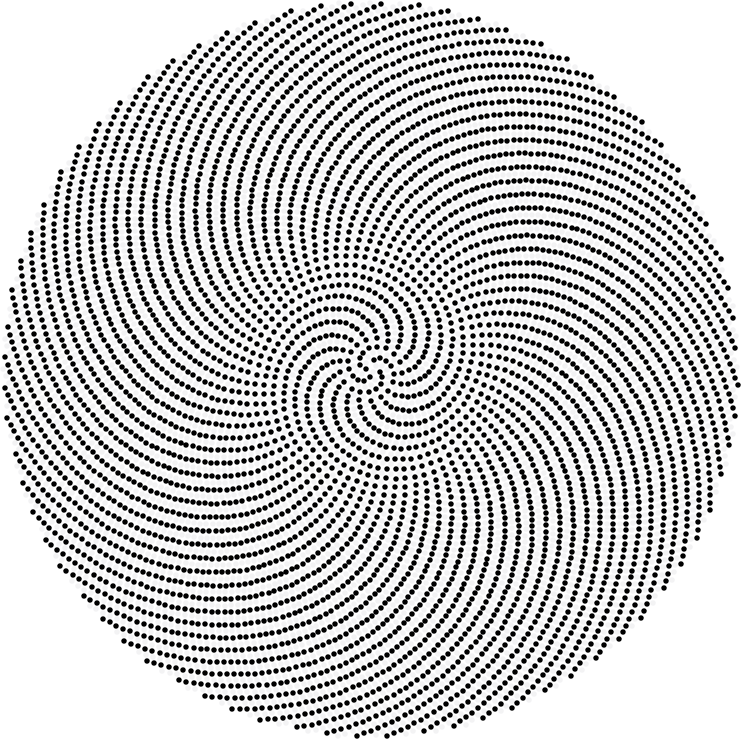 This gives the curves of prime numbers we saw. Lovely work, Henry, the fundamental pattern is so compelling it is great fun to add patterns on top. I’m just starting my high school research on this topic but in connection to pine cones. I would be really grateful if someone told me about a programme where you’ve done the plotting of the numbers and points. and if anyone feels like explaining some extra questions to me, I would really appreciate it. 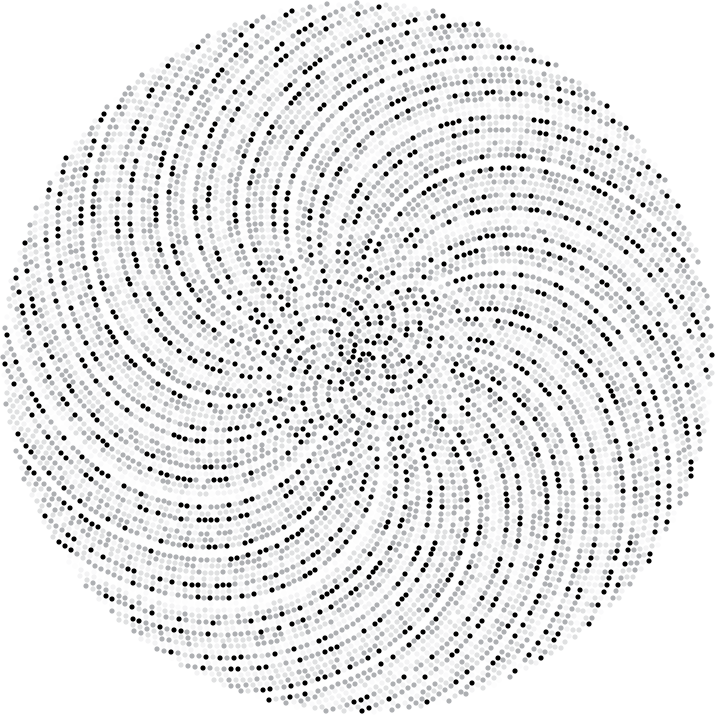 I used the general purpose math software Mathematica. If you can do some programming there is a free alternative called SAGE, that is worth looking in to. very interesting page. 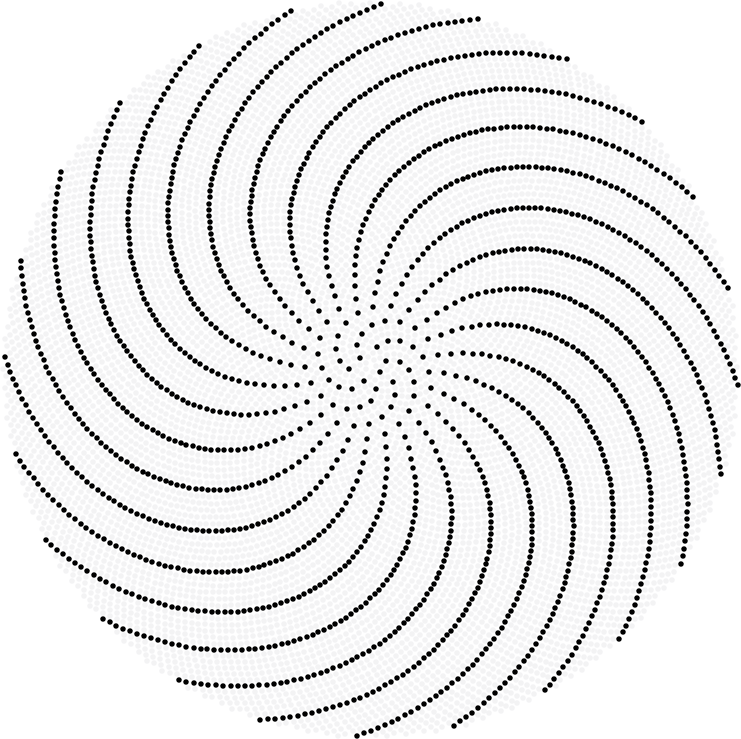 I’m writing about something I have not seen tried before: regarding your vimeo video called “Phyllotaxis spirals” *and* the 2nd, 3rd and 4th picture below the video, which are phyllotaxis spirals with only the primes showing – if you were to rotate those prime spirals in those pictures, in exactly the same way as the fully populated spiral is rotated in the video, would that not be something brand new? I haven’t seen that done anywhere. 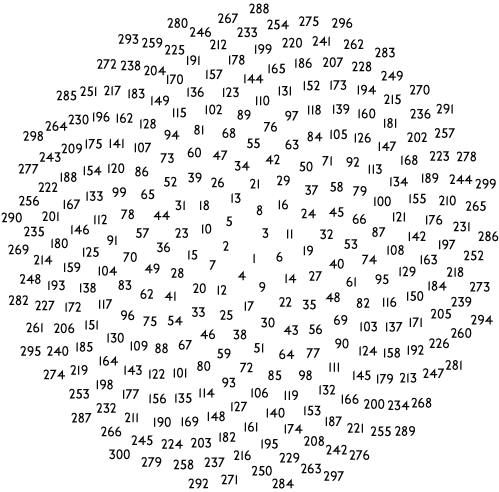 I’m conjecturing that unprecedented prime patterns may just show up there. 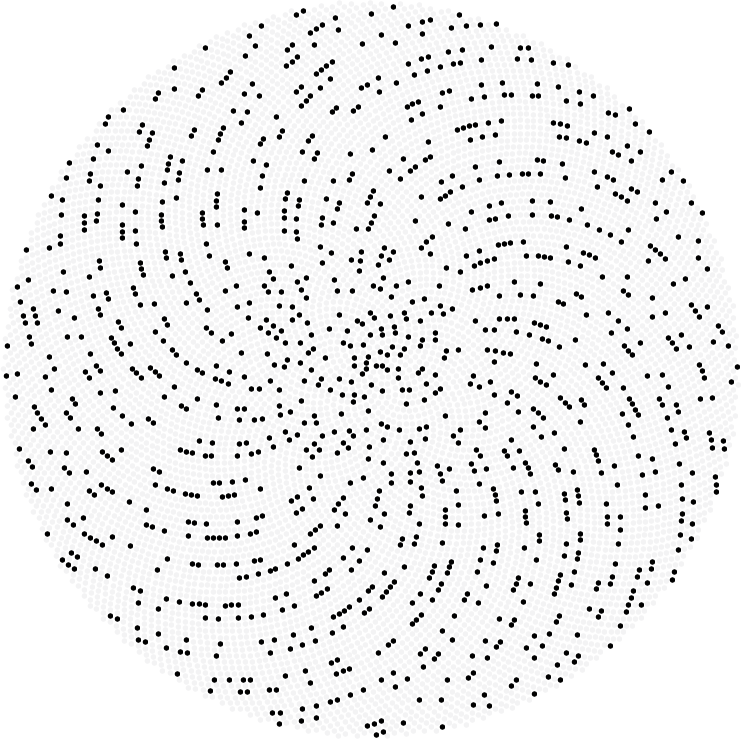 it would be sort of like a Ulam spiral but vastly superior, because instead of having hard 90-degree jumps like the Ulam spiral does, you’d have a completely smooth phyllotaxis spiral, rotating while showing only the primes. just like in your video, how things line up at the square root of 2, square root of 3, etc., primes might unexpectedly line up in unforeseen ways in the scenario I described.